We have already written many dozens of articles about the UPC, in addition to hundreds more about the same thing under another name (e.g. “Community patent”). What will it take to stop this injustice? Well, in our experience, the best way to deal with this issue is simply inform people, whereupon those who promote this thing become too shy to promote it in public (it’s career suicide) and everything cools down until the next rename, accompanying a new lobbying push. Some of these helped show the role of Battistelli in UPC lobbying (even half a decade ago). So much for EPO as merely a patent office; it intervenes in policy. Stjerna’s book is already having some impact. Pro-UPC circles seem a tad worry. 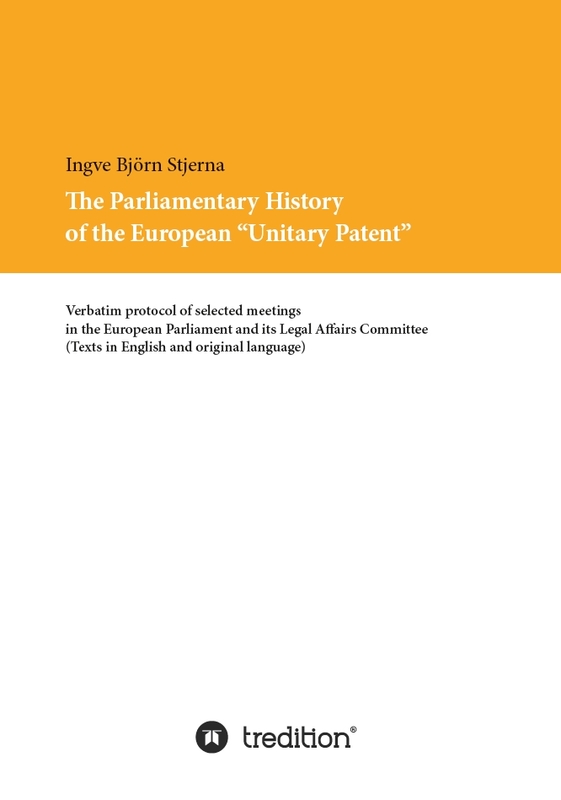 One who has criticised the lack of UPC transparency and some legal shortcomings says: “New book on #UPC – ‘The Parliamentary History of the European “#UnitaryPatent”‘ by Dr Ingve Björn Stjerna” (linking to the reviews/purchase page). When a UPC critic (even if diplomatic/polite) writes a whole book it really means something because never before was there such an extensive body of information about the UPC in one single place. This book on the “unitary patent package” might actually give politicians — if not patent lawyers too — something to think about before blindly accepting the UPC as something beneficial because “unity” or “community” or some other euphemisms along those lines (calling it “Corporate patent” or “Wider litigation patent” wouldn’t be so wise, would it?). See the new article titled “One Patent Law, Two Economic Sectors: Is The One-Size-Fits-All Patent Law Still Workable?” Another reason why the UPC would be a complete mess, impractical to implement, unworkable in practice and so on? It needs to be abolished before it even becomes a reality — something which would devastate Battistelli and his ilk, that’s for sure. Yes, I read all the comments in IP Kat (via RSS feed, usually simplified HTML). A lot of commenters in IP Kat are themselves patent lawyers and I don’t share their view on the benefits of UPC, not as a programmer anyway. I singled out Bristows because they’re more vocal than the rest this way and if put under the limelight they might need to tone it down a bit, at least for their reputation (which is the only thing they go by). I didn’t mention Annsley Merelle Ward, I don’t want to make it too personal. But it’s not just her anyway. As seen with TPP, companies and people shy away from publicly promoting when the response from the public becomes harsh. “Informing the public is particularly difficult in this case,” our reader stressed. “While anyone has at least some vague understanding of what TTIP or TPP are about, this is far more difficult with regard to patent litigation and its planned centralisation via UPC. Those having that insight and expertise are also the same people seeking to profit from the new system, so you will rarely find any well-founded critical voice. Bristows may be unusually loud, but others are far deeper involved and pulling strings in the background more discretely. Truly a remarkable statement from Mr Pors. If a partner of an international law firm declares that the law should adopt to the circumstances “where needed”, this speaks for itself. I always thought that, at least in states abiding by the Rule of Law, it was the law setting the standards and forming the framework for legislative activity on “what is needed”. For Mr Pors, an end which he deems desirable seems to justify the means, even if this involves sacrificing some very fundamental democratic rights and principles, e. g. transparency. I am not sure whether such legislation can really be called “progress”, as Mr Pors claims. We shall see what the European Court of Justice’s position is. How many granted EP patents were later found by a national court to be invalid for reasons which were avoidable (ie which arose because the EPO search or examination was flawed)? How many EP applications were refused by the EPO which a national court would have ruled to be valid?